Lose the cord but not the power! Step up to more power and longer run times with this 7.2-Volt Li-Ion 2-Speed Cordless Screwdriver from Genesis! This lightweight power tool includes a lithium ion battery, charger, 4 quick-change hex-shank drill bits and 4 screwdriver bits. 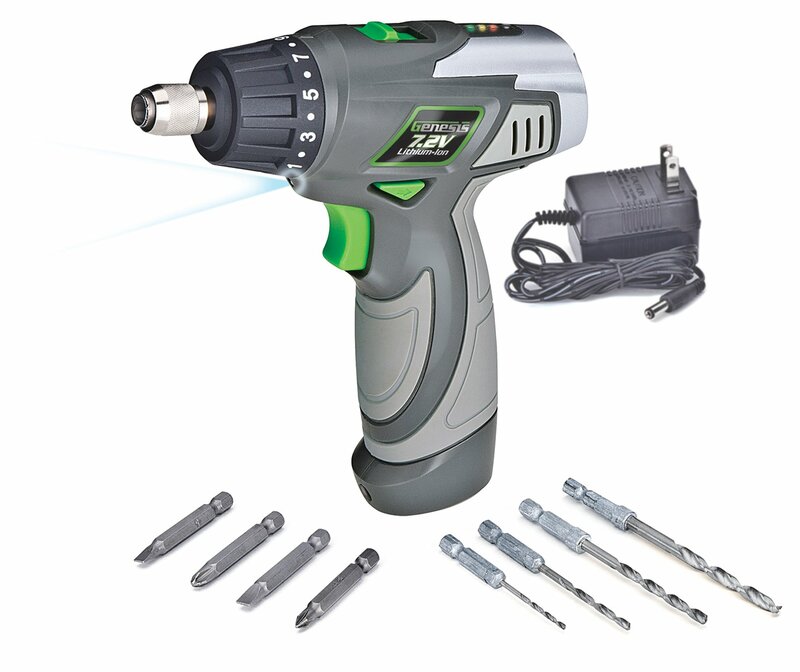 Electric Drill Power Tool 7.2 Volt Two Speed Screwdriver Built In LED Work Light 1/4" hex quick-change chuck2 speeds (200rpm/400rpm) for versatility46in-lbs torque3 hour-5 hour battery charging timeIncludes 7.2V 1,300mAh Li-Ion battery, charger, 4 quick-change hex-shank drill bits 4 screwdriver bits Genesis GLSD72A 7.2V Lithium-Ion 2-Speed Screwdriver, Grey, 3/8-inch chuck with Trigger Activated LED light, Battery Charger, and 8-Piece Accessory Drill and Driver Bit Set Lose the cord but not the power! Step up to more power and longer run times with this 7.2-Volt Li-Ion 2-Speed Cordless Screwdriver from Genesis! This lightweight power tool includes a lithium ion battery, charger, 4 quick-change hex-shank drill bits and 4 screwdriver bits.